McNair Mini School advocates personal growth beyond the academic, and our students often return from trips with new perspectives. Below is an archive of trip reflections that chronicle these moments in time. My experience at Harbour Light was a really good one. I enjoyed interacting with the people there but the best part was R’s story and especially his poem. I think that it is important to volunteer and assist but what was more important about going down there was the exposure to the ways of life that exist so close to us. Harbour Light was one of the most surreal experiences that I have ever gone through, to see such a surreal reality up close was extremely eye opening to say the least. It felt amazing to know I could help no matter how small. I am looking forward to the next time I can volunteer again. Harbour Light was a very rewarding and eye-opening experience. Being able to give back to the community and put a smile on their faces was a touching experience and I feel grateful for the opportunity I had. Going to Harbour Light was an experience that I won’t forget, seeing people in the conditions that we dread of in our own society is a scary sight. Volunteering at Harbour Light made my day. Seeing the hardships an individual can go through just to eat really emphasizes our privilege. I would love to volunteer again as I would love to learn more about what harbour light does. “Thank you” wasn’t needed from the people we were giving out the food to. You were able to see the gratefulness and thankfulness in their grins. Their grins and smiles made it worth the while. While I was volunteering at Harbour light, I really felt like I was giving back to the community. It was really nice to know that even a few hours of volunteering can really make a difference in someone’s life. Going to Harbour Light was an experience I’ve never had before, giving and helping out others in the smallest ways put the biggest smile on my face. My harbour light experience was very humbling. I was the beans man. My job was to fill the plates with beans. I felt it was a lot more fast paced than what I was expecting. It was so fast paced that I even ended up using my hands instead of using tongs to grab the beans. I turned my job into a game. I tried to see if I can be faster than Celina who was putting rice on the plate. Occasionally, I was so fast I would put beans on the plate faster than Celina could put the rice, and every time I did that I got super excited. I felt good at the end of the day because I had a lot of fun working in the kitchen and it’s nice knowing I got to give back to my community. This Strathcona trip marked my third year of being a part of Mini School and every single year I leave Strathcona with an overwhelming amount of memories, experiences, and gratitude. One part of the trip shone brighter than the others: during the challenging canoe ride back to the lodge, there was a ceaseless rainfall which made the journey tough. This rain and urged my group and I to maintain a steady paddling pattern and push through it. My group was a forever flowing river of support and I knew that is was okay to not the best paddler or to make a mistake because I will be accepted not matter what I did or didn’t do well. Through this, I learned that even if the most difficult scenarios and situations get thrown at me, if I have the right group of people by my side, anything is possible. However, learning about the acceptance my class has for me is not all I learned on this trip. I truly understood what having a “Mini School family” meant. As the years have gone by, I’ve always known that we were a family, but I never truly felt it. But as twenty-seven of us squeezed into the cabin common room with some of us on the floor, standing, or even sitting on the fireplace, I suddenly became very aware of that family feeling everyone is always talking about. That night we talked, sang, and laughed to our hearts’ content. Moments like these with my class are what I cherish because they truly make me feel like I am a part of something. I know that this group of people will stick with me forever because bonds like these don’t break easily. Darkness encircled us leaving our minuscule lights useless. With ice-like hands we crawled, climbed, and squeezed in a cold shadowy cave. Mysterious sounds and frightening thoughts clasped me as I struggled to overcome my toughest obstacle. Not the large trench that stood in between me and the end of the cave, but myself. My own fears and doubts were holding me back, but Mini school has taught me that the best adventures are the ones where you abandon your comfort zone and “push the envelope”. With a newfound sense of bravery, I took the leap and found myself among dazzling pristine crystals. We were indoors yet it felt like a cool starry night, and that is a moment I never want to forget. This past trip to Strathcona was undoubtedly my favourite year, not simply because of what I experienced, but simply because of how I felt. This year, I, along with my group of nine others, ventured out on our newest experience, mountain biking. Throughout the trip, we bonded over a plethora of challenging, discouraging, hilarious, and most of all, wet moments. Despite this, and somewhat cloaked in irony, the most prominent memory that will forever remain with happened just a few minutes before we left behind the barn we ate, slept, and played games at, gave a final insult to the rain that made the trip all the more difficult, and bid the alarm clock of a rooster a final farewell. Before entering our ride back to lodge, I took a second to look at the muddy and relieved faces of my group-mates: my friends. And in that moment I realized the true feeling of happiness. After trudging and struggling through the rainy, arduous days of chain-breaking and knee-scraping with this group, I finally reached a level of contentedness previously never felt, a feeling of complete comfort and confidence with my peers and with myself. I can say with 100% certainty that this year of Strathcona has been my most educational one, as I have learned what makes me truly happy—my friends. We had only just left the lodge, and as the balcony of the dining hall still clung to the edges of our vision, we let out a sigh, all thinking collectively about how we would never be dry again. As soon as our canoe hit the water, the heavens opened up and rain came pelting down around us. We knew it would happen, it happens every year, but every year we still live in denial hopping that just once we’ll get to feel the heat of the sun on our backs as we start our journey. However, it’s never been the case, so as we dipped our paddles in the water of the lake we all braced ourselves for three days of wet shoes and wet socks. The one thing the rain couldn’t dampen however hard it tried was our determination, we rowed our canoe to the shore like a well-oiled machine. We refused to rest, all of us clinging to the prospect of a warm sleeping bag. The sound of sand hitting our boat was music to our ears, our sore arms rejoicing at the sudden relief. Our euphoria didn’t last long however, when we were instructed to leave the canoe and walk to the shore. Some people tried to fight it, walking to the end of the canoe to avoid completely submerging their feet. Others took a deep breath of defeat and gave into the knee-high water. In the end all of our feet resembled raisins when we took off our shoes trying to give our waterlogged feet some relief. As the sky slowly darkened and we sat around an unlit fire pit, we reflected on our day and realized it was one of the most laid-back trips we had ever been on. The campfire songs we sang around the unlit fire will always resonate in my mind, us all together under a tarp, the sense of community was priceless. As we sat in the soft glow of peoples flashlights and tried to keep warm we replaced our negativity with gratitude and headed off to our tarp exited at warmth sleeping promised. 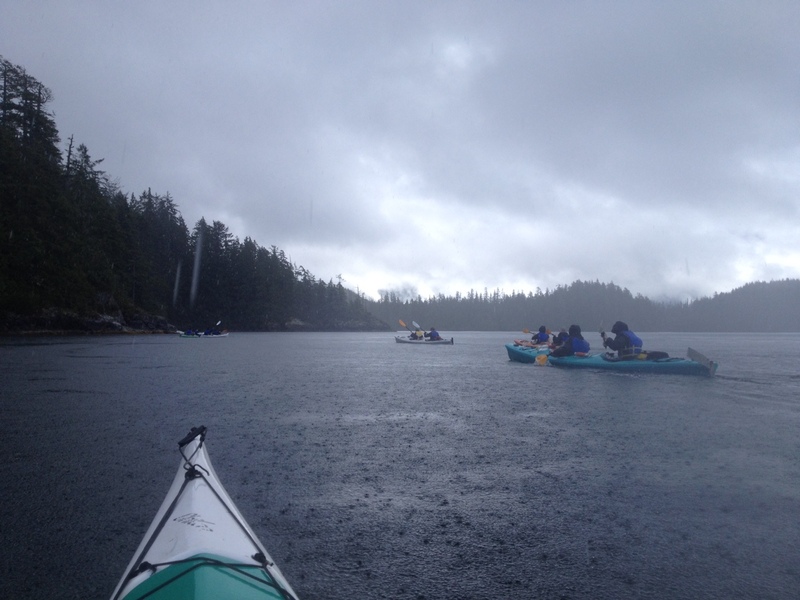 It was a rainy and miserable morning on the second day of our sea kayaking trip at Strathcona Park Lodge. Nine grade ten students woke up one by one to the sound of the rain and the voice of one of their instructors. I checked my watch. It was 10 am. I groaned — it was going to be a long day. We got up slowly and packed up our belongings. Despite the fact that we were staying one more night at the campsite, we didn’t want water to get in under the huge tarp that was protecting us from the rain; and we definitely didn’t want to come back from another day’s kayaking to wet sleeping bags. Despite our attempts at dissuading our instructors from making us go kayaking, we quickly set off after putting on our unpleasantly cold and damp wetsuits. The rain was showing no sign of letting up, but we paddled on. 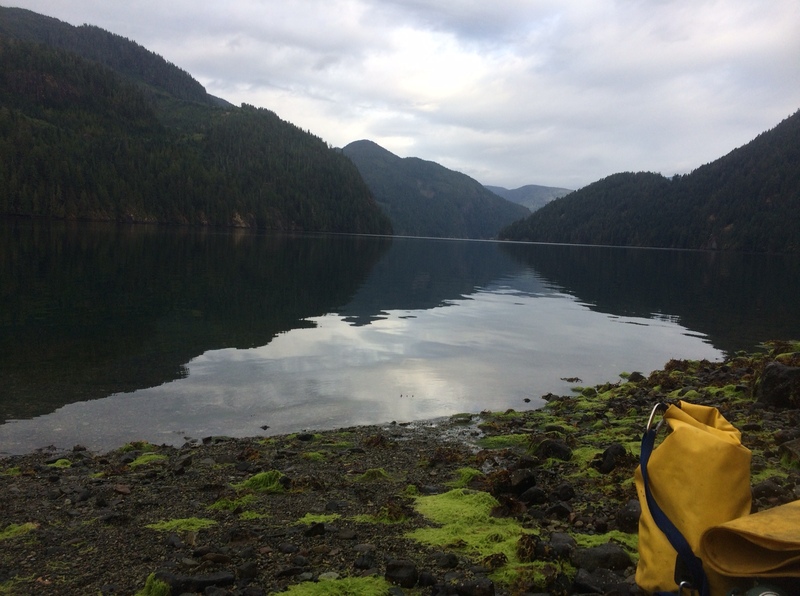 Eventually, after passing an oyster farm we had spotted the first day, and meeting up with the other group of sea kayakers, we arrived at some rocks that were covered with seals and sea lions — there were even some pups! The rain had calmed down for a while and seeing those animals was definitely going to be the highlight of our day. Four kayaks rafted up. Rafting up is where you grab on to the other kayaks around you to form a sort of raft. We soon noticed that forming a circle around us were approximately eight seals. We were surrounded on all sides! We watched to see what they would do, and we noticed that they were slowly getting closer; we were being hunted! Eventually one of our instructors called us and we paddled through one of the gaps in the circle; we were safe! 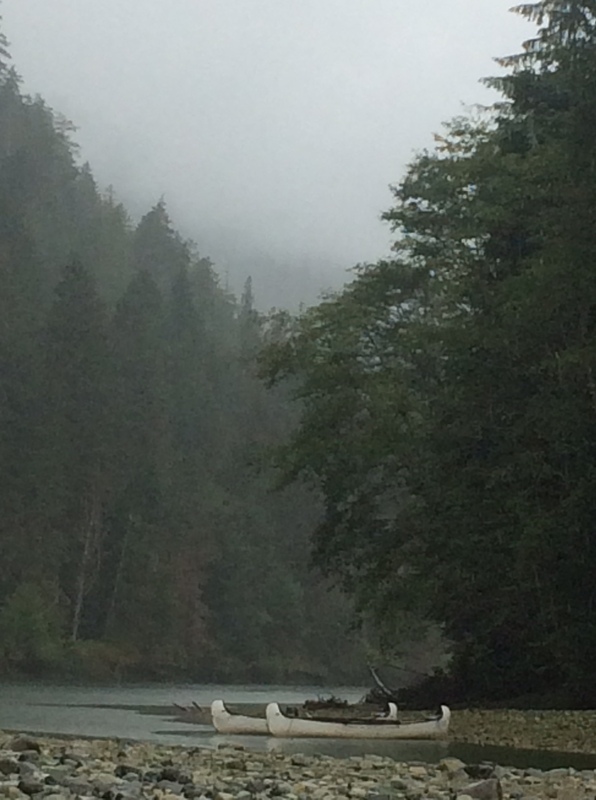 We paddled to land, where we ate lunch in the rain which had unfortunately resumed. From there we proceeded to go back to our camp. To this day I wonder what would have happened had we waited there for the seals to get to us. On this trip, I have learnt that the lowest lows produce the highest highs, and the end results are definitely worth the bumpy journey along the way. I have come to appreciate the ups and downs that come with the privilege all of the Mini School students have of going to Strath. We get to go out every year and push out of comfort zones that we didn’t even know we had, and didn’t know were hindering us. Without the horrible weather, incessant mosquitoes, and uncomfortable situations, I never would have realized how fortunate I am to be a part of such an important program. The most meaningful experience of sea kayak for me was realizing the true majesty of the nature all around us. During this trip I had a lot of time paddling out on the water to reflect on how much respect the environment deserves and how interconnected everything is. The algae give, the wildlife take, and the cycle goes on. I had always taken what I had for granted and never truly appreciated just how much we, as humans depend on everything around us. This trip was truly impactful on me as it taught me not to take what I had for granted and to not overlook the beauty of what we have around us. Everything had its ups and downs. While it is true there was no dry weather, the rain made beautiful rainbows. While it was true the low tide meant we had to carry our kayaks all the way down to the water, the ocean also had beautiful bioluminescence for us to appreciate. In all honesty if you never have a down, and things are always perfect, then you will never be able to realize just how fortunate you are. That is why I think Strathcona is really important for our Mini School student. It is a humbling experience that teaches us a little more about ourselves each and every year. to share a story that was barely sublime. yet deceived with hopes of something divine. it was rain! oh boy what horrible a pain. a tarp or two would surely do, but no said the weather. But hey! There were adorable seals so that made it a little bit better. So although it was sad to leave in such bad weather, it left a wonderful story to always remember. So remember this poem, for years to come, because though we may leave, memories will last, in word, or will. 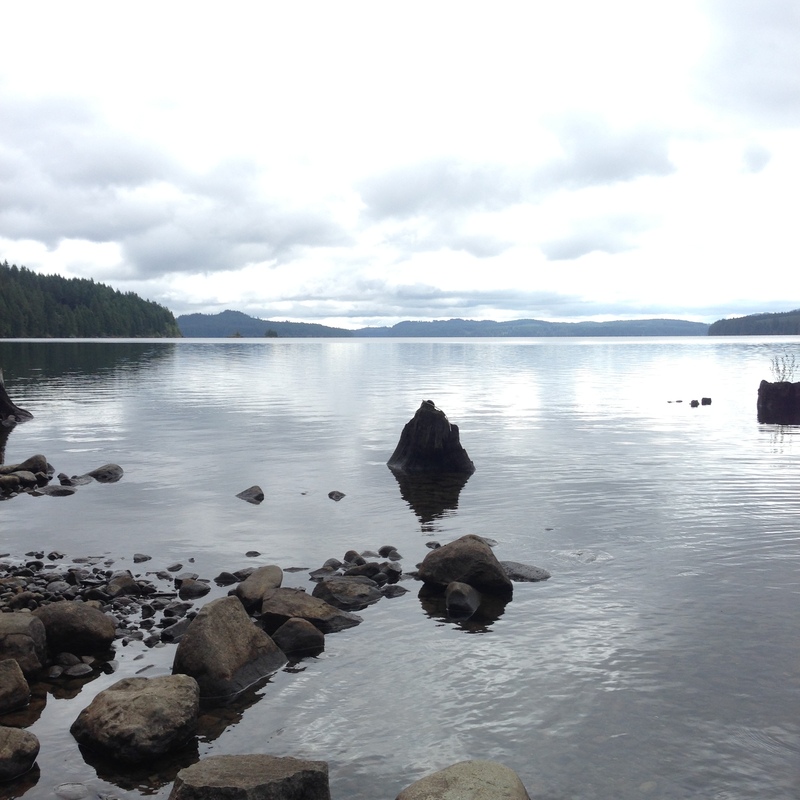 Describe 3 things that you will miss the most about our trip to Galiano? Explain. 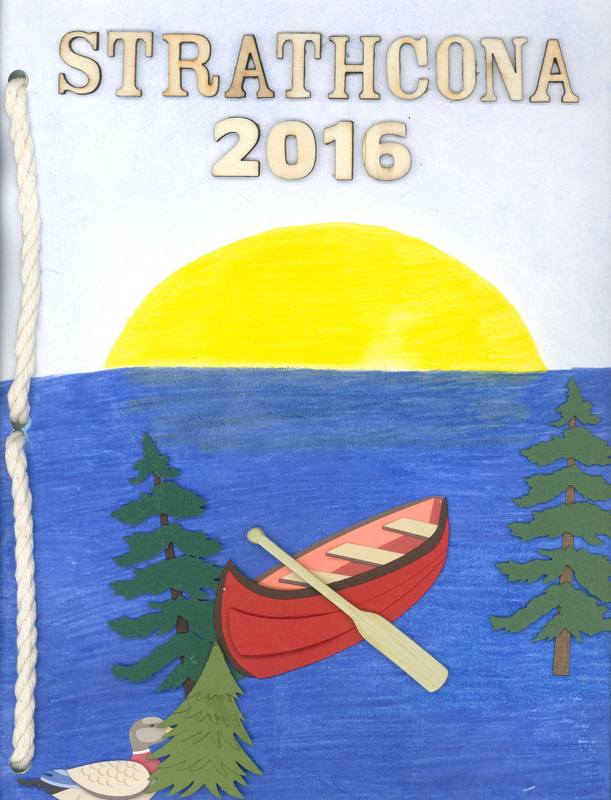 “…the peaceful outdoors and the calming, colourful sunsets we watched each night “– Megan J. Give a detailed description of how you “pushed the envelope” on this trip? After biking, camping, cooking, and hiking on Galiano Island for three days, describe 1 thing and 1 person that you are more grateful for having back home. “The person I am more grateful for is my mom because I don’t know how she does it. She has to cook for an entire family, go to work, take care of her kids and dog and organize and plan everything out” – Megan Y. 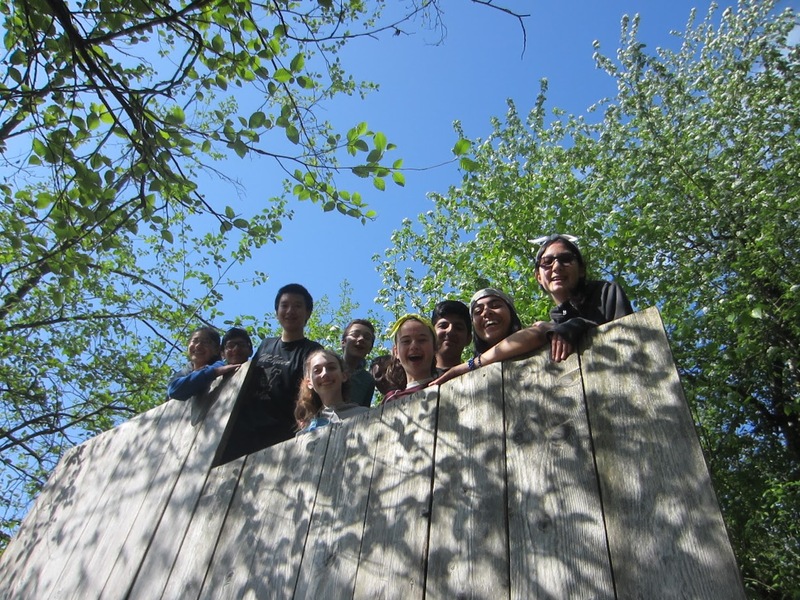 The grade 9 class reflected on their Timberline Ranch experience. They were asked a number of questions about the trip. Your partners for the Amazing Race were randomly selected. Why do you think this was done and what do you think it eventually taught you? Being a part of Mini School means belonging to a community of like-minded individuals. Explain what you feel you “get” out of these trips and why they are important to the success of a Mini School class. As we started our hike to Lupin Falls, there was a positive feeling of laughter and joy. The sun was shining and the birds were singing on the mahogany-hazel trees. We all had to share the weight of carrying the food and supplies in daypacks, which was an audacious activity. As we began walking through the winding and damp trail, I realized you have to be self-sufficient and take responsibility for your belongings. At home, this is a luxury many people take for granted. 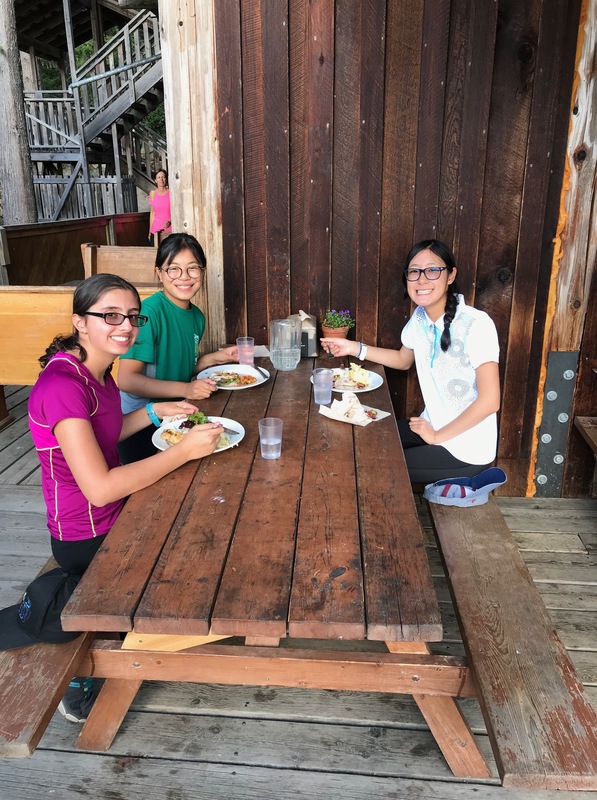 As my group and I reached the top, we prepared various meals, which were delicious–something I would never do back at home. 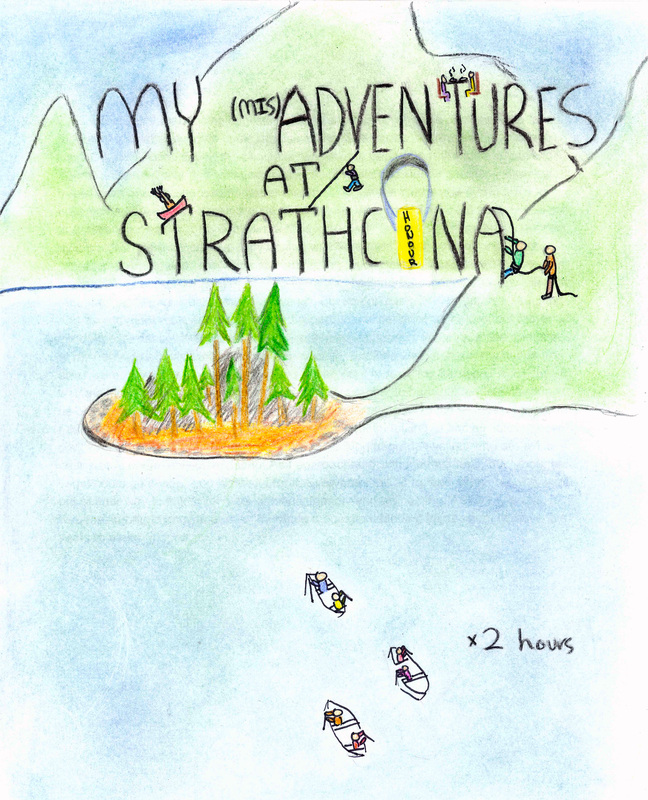 Strathcona was an amazing experience because not only did I make long-lasting memories, I learned how to be independent, well-rounded, strong-willed, and analytical. 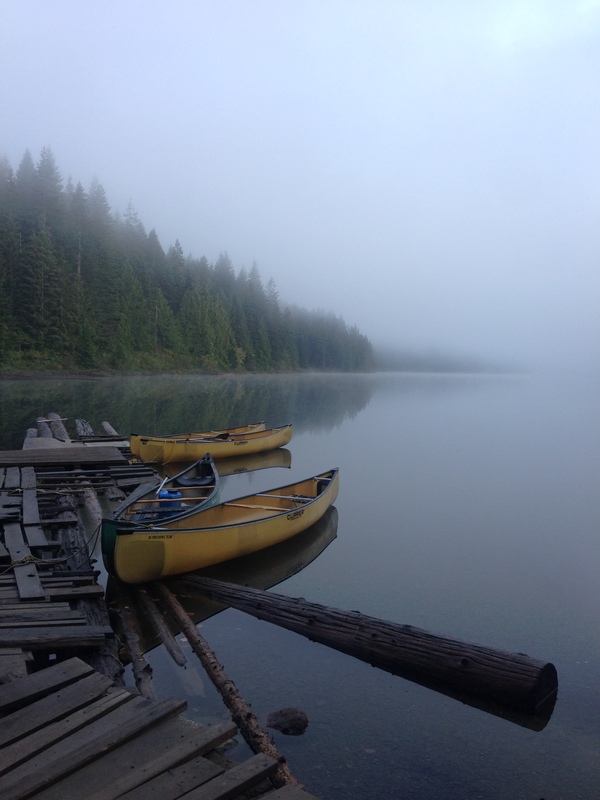 It was the second day of my Strathcona trip at Brewster Lake and I was ready to give up. Dark clouds loomed overhead as sharp pellets of rain stung my skin and my muscles ached with a stubborn ferocity. Then, when I did not think it could get any worse, I stepped directly into a pit of mud and was completely soaked from the waist down. In that moment, all I wanted to do was break down, but instead I picked myself up and continued on which was one of the most physically and mentally arduous things I had ever done. 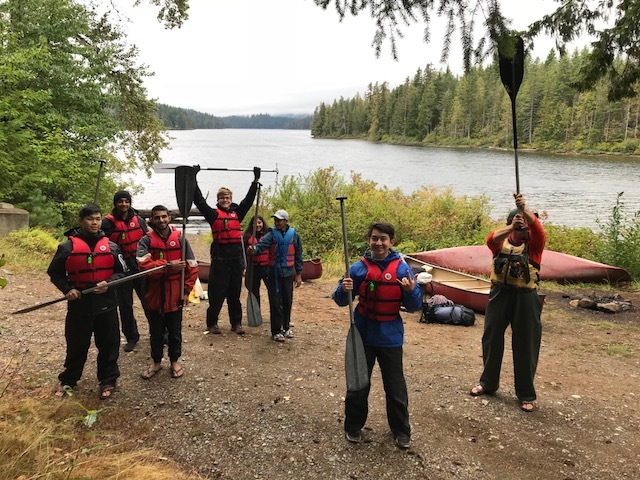 Looking back, I am incredibly grateful for my Strathcona experience, as even though it was difficult, it taught me perseverance, an invaluable lesson that extends far beyond an outdoor trip. Swimming, Dancing, Raving it up! Sea Lions, Bears, Schools of fish! Ooooooo the wild so juicy and crisp! We ain’t ever gonna quit! 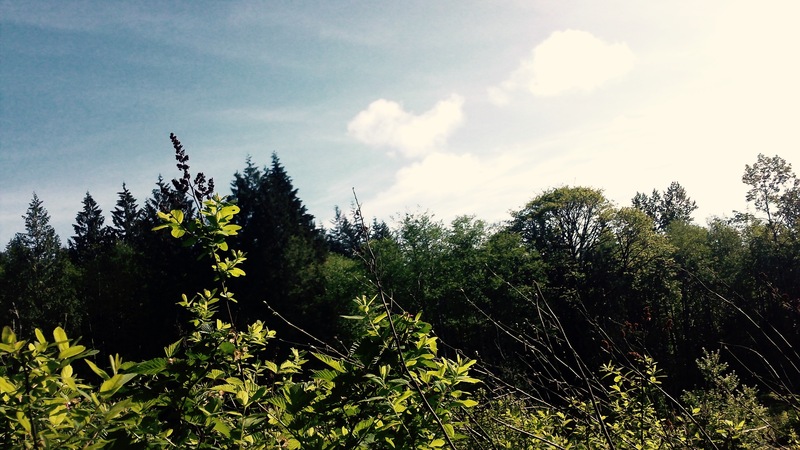 – Cole L. & Kylie D.
We had been walking for hours now up and down in a zig-zag pattern. At this point, the rain had gotten worse–a lot worse. We all walked in silence now, either because the rain drowned out our voices or because we were utterly miserable. The only thing that kept me going wasn’t because I wanted to feel accomplished or prove myself to my friends. No, the thing that kept me going was the blueberries. Around almost every corner was another sour blueberry. Every bite kept me going. We got up to a point where there weren’t anymore bushes to pick from. I couldn’t wait to get back down the hill and pick some more. The true moral of this arduous task wasn’t that if you persevere you can get through anything, but instead berries can keep you motivated for a “berry” long time. I was blind. The brash blizzard, the great gusts of wind, and most alarmingly, my head falling into the back of a fellow skier in front of me all obstructed my ability to control my rush down the mountain. Skiing is not my strongest suit, to say the least. I tumble, I fumble, and I stumble along the powdery nightmare often, yet I still find the sport very fun. The right combination of friends, laughter, and challenges allow a euphoric feeling to overcome me, but this elation was immediately shattered when I found myself falling faster down the hill than the blinding snowflakes around me. My head pushed itself into the nearest solid object it could find: the back of the skier in front of me. Amidst whiteness and terror, we ungraciously charged down the mountain together, only to be separated by my less than elegant dive onto the frozen blanket. As I have already stated, I am not a talented skier, but this lack of capability creates memories to always have to laugh at. What is teamwork? Teamwork is working together to achieve a common goal. This was represented several times through various activities throughout our adventure at Strathcona. Canoeing is a prime example of teamwork at it’s best. On our way to Rainbow Island, my group paddled individually which took us a very long time to reach our destination. So on our way back to Strathcona, we decided to try paddling altogether in unison as a team. We pushed our paddles deep into the water and pulled them out together. This time we could actually see that we were making better progress. Working as a team was much more efficient because we got back to camp faster than our arrival. Before Strathcona I barely knew anyone in my group, so listening to everyone’s ideas and actually working together was a bit of a challenge. But as the days went on we became like a little family. 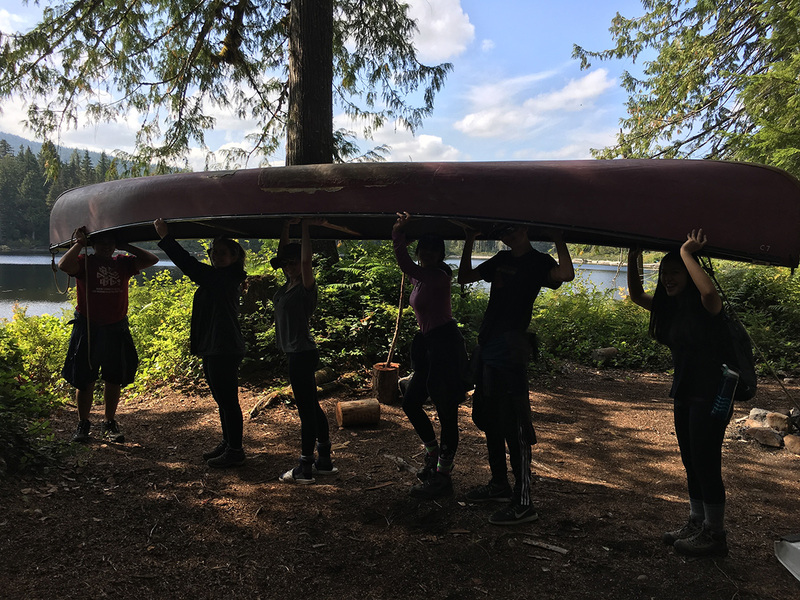 Canoeing, along with numerous other activities were more effortless by working together as a team rather than by ourselves. Therefore, if I work with others on a daily basis, tasks will get done faster and accurately. Strathcona definitely taught me a great deal but I would have to say learning how to work well with other people was by far the most important aspect of this experience. Through this practical course I learned the valuable life lessons of achieving self confidence and teamwork that can be used for future challenges. 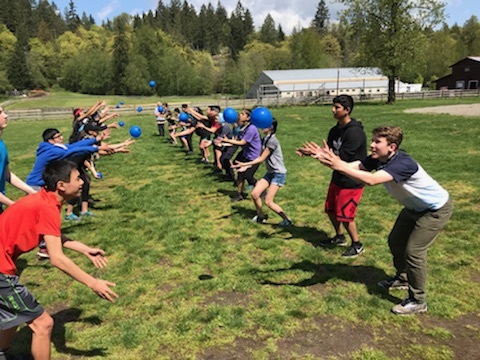 Through experiencing mini school for a short time, we were challenged to “push the envelope” wherever we could, and so to me, Strathcona was the perfect place to start. On our second day at the campsite, we were to depart from the area to leave for Rainbow island. I was fine with cooking my own meals and sleeping under a tarp, but three hours of canoeing was no better than torture. On the canoe ride there, I rowed until moving afterwards became quite painful. With every paddle I could feel my energy and patience dwindling. My arms were tired, and my legs were stiff from sitting on the hard, rough wood for hours on end. The water started feeling much heavier as I pushed it back with my paddle. I felt like our goal of arriving there was beyond my grasp. Defeat invaded my thoughts, and I genuinely wanted to give up. But seeing everyone around me, laughing and having fun, I realized that I shouldn’t regard this experience as torture, but rather a bonding experience. With that in mind, I continued enduring the pain and dampness of my pants, but having a blast while doing so. By the time we got there, my hands and arms were numb from the cold water and the amount of paddling that occurred. While it was a difficult journey, it was comforting and encouraging to hear our leaders cheering us on, as well as knowing that everyone was suffering as much as I was. I also breached my limits socially, when I was given the task of talking to and socializing new people of all grades, and my new classmates. Talking to grade twelves who are twice your size is undeniably intimidating. As I approached them, I felt nervous, but I thought what could go wrong, so I just went for it. Everyone I talked to, and everyone who went out of their way to talk to me, was strikingly friendly and welcoming. As for my peers, it was reassuring to know that even if I made a questionable first impression, I’d have five years to make up for it. A swirl of glowing green glazed the shadowed salty sea only to be lit up by the bright moon. My paddle grazed the surface of the sea, causing bright phosphorescence to line up around my kayak. The sky littered with shimmering stars caused me to marvel at the beauty of all my surroundings. To be with people who I thought of as strangers before, but now as close to me as family: my Mini School family. A campfire becoming increasingly dimmer and further sat in the distance. As all this surrounded me, I lay back, took in this remarkable night, and thought to myself that there would be no other place that I would rather be than this amazing sea kayak night. The exhaustion felt from a long day of paddling made me want to do nothing but sleep, and having to go further was a task too arduous to think about. 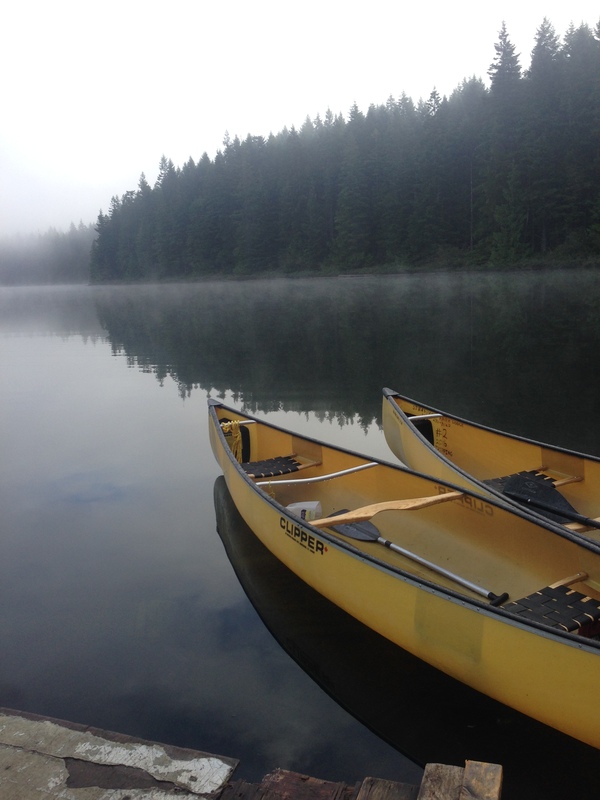 Canoeing nonstop made me feel robotic and numb; my fingers had turned purple from gripping the paddle so tightly, and just when it seemed like nothing could liven my tired mood, the instructors told us all to look around and just breathe. As my grip loosened and my shoulders relaxed, I was able to take in the beauty of the blue sky above and the salmon-filled water below. Seeing nature in such a calm form made me realize how each stroke against the waves, no matter how difficult, was completely worth it. Being able to float peacefully in the middle of the ocean with some of my closest friends showed me how fortunate I am to live in a world where such beauty exists. I stared up into the blanket like sky of stars: watching, thinking, and listening. It was a chilly night with a frosty breeze washing over me. I was bundled up in my warmest of clothes as I lay down on the rock underneath me, while the rest of my group and I listened to an old Chinese folk tale our instructor was sharing. I could hear the light slapping of the water below us as it hugged the rock over and over. The trees that waved nearby had an umbrage-like effect on the smooth surface in front of me and the stars twinkled in many different shades and sizes. I couldn’t stop thinking how peaceful it was to be out where there was no trace of the city that now lay behind me and that the sky I was looking up at surrounded my entire world like a soft light hat. I leapt between the jagged stones with ease. The forest was far above my head as I bounced amongst the sodden rocks of the falls. I ascended higher and higher up the slippery rock face and peered back. I could see my companions a dozen feet below me and the rushing waterfall under my feet. I cracked a smile and turned to venture further, when suddenly, I felt a shift in the terrain. The rock I stood upon moved and fell, leaving my leg trapped between two boulders larger than me. Panic set in and my life flashed before my timorous eyes. What was I to do? Would I ever escape? I shifted my leg, only to find that, to my astonishment, the rock anticlimactically fell away, leaving me completely unscathed. Close one. 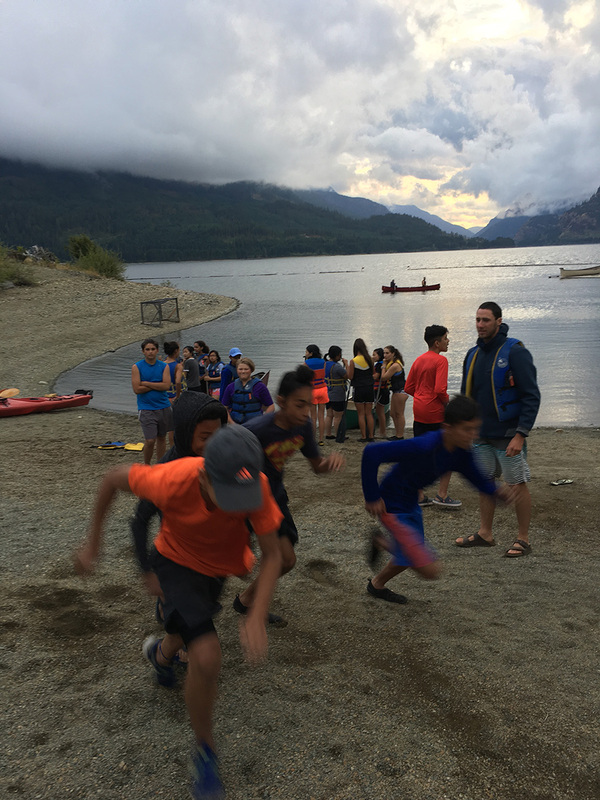 The moonlight glistened in the water, the waves splashed against the mountains and the stars shined so brightly in the dark sky—this was one of my fondest memories from my Strathcona trip this year. It was late at night and most of my friends had already went under the tarp to sleep for they had to rest from our strenuous hike to Mount Myra. Although it was cold and I was tired, I was so mesmerized by the beauty of nature that I could not bring myself to leave. Two of my close friends and I lay down on the jagged cold ground gazing into the magnificence known as space. While we observed the sky, we found the Big Dipper and caught a glance of the Milky Way. I stayed out for as long as my shivering body could bare, then went to bed under the tarp astonished how marvelous our world was. After this trip, I now have a newfound perspective on how the way we treat our world has affected it from being a spellbinding place to paved ground with buildings and pollution everywhere, and I will always try my best to contribute to correcting our past errors and celebrating nature’s beauty and not destroying it. On April 15th my mini school classmates and I, trekked to the downtown east side. I was witness to many familiar yet saddening views while approaching soup kitchen. Among the many sights on the walk there, the most disheartening was the long line of people waiting outside the centre for a meal. This opened my eyes to the large community of poverty stricken individuals, of which I was unaware of the quantity, and gave me the reassurance that what we were about to do would bring help and bring joy to many. 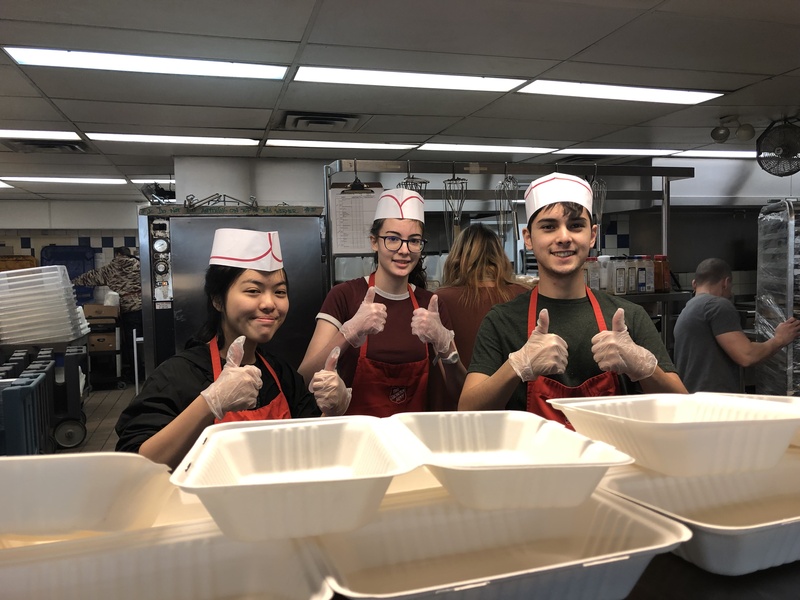 The whole experience at the soup kitchen has given me the motivation to get out into my community more often to help others and my goal is to continue volunteering at the soup kitchen in the future. Often we are so wrapped up in our lives that we forget the importance of giving back to the world we live in. Through our day at the soup kitchen, we got to do exactly that. Giving the homeless and needy people of the Downtown East Side a free meal was not only an eye-opening experience but also an inspiration. The volunteers were all recovering addicts and some of the kindest people I’ve ever met, and it truly goes to show that it’s never too late to turn your life around. No matter how busy one’s life may be, taking the time out to give back is essential to being a member of society, and I am truly grateful for this opportunity. I have always heard stories about less fortunate people but never realized how much of our society lives like that; in 45 minutes we served 400 people. They rely on places like the soup kitchen to survive so being able to be apart for their day was an eye-opening experience. Even though I was just putting gravy on a Salisbury steak and a dollop of mashed potatoes it was much more then that, I was able to make someone’s day better. I would go back and volunteer at the Salvation Army Harbour Light, in a heartbeat. Having visited the downtown east side twice already this year, there was no surprise to the amount of poverty and struggle present in this area. It was relieving to finally be able to make a difference in this neighbourhood rather than just observe. It was very interesting to see the vast variety of people who came through the doors to receive something so simple that we all take for granted. The most heartbreaking thing I came to realize during this experience, is how some people will run through the line and scarf down their meal in order to come back around to get another serving to pack away and eat later because they know otherwise they will not have a dinner or breakfast. Even though our hour had gone by so fast and I would have liked to have stayed all day and feed as many mouths as I could, I was content with the fact that I could make someone’s day by simply handing them a tray of food. As I watched many of the soup kitchen’s visitors pack their food into Tupperware containers, I wondered “why?” Why are they not taking their time to sit down and eat? Why do they spend, in total, 5 minutes at the soup kitchen? I think they do this because humanity always has the urge to be altruistic – we all want to give back. While you and I can donate materialistic things such as clothes and money to the disadvantaged, these people simply cannot afford to lose a dollar or a sock; instead, they give a sense of community. 5 minutes at the soup kitchen means that the kitchen has another minute to serve another. The soup kitchen’s patrons, they look out for each other, making sure that the kitchen is able to feed as many mouths as possible. Through this experience, I realize that “giving” doesn’t always have to be a tangible object; sometimes, a compliment, phrase of encouragement, or help is all that is needed. 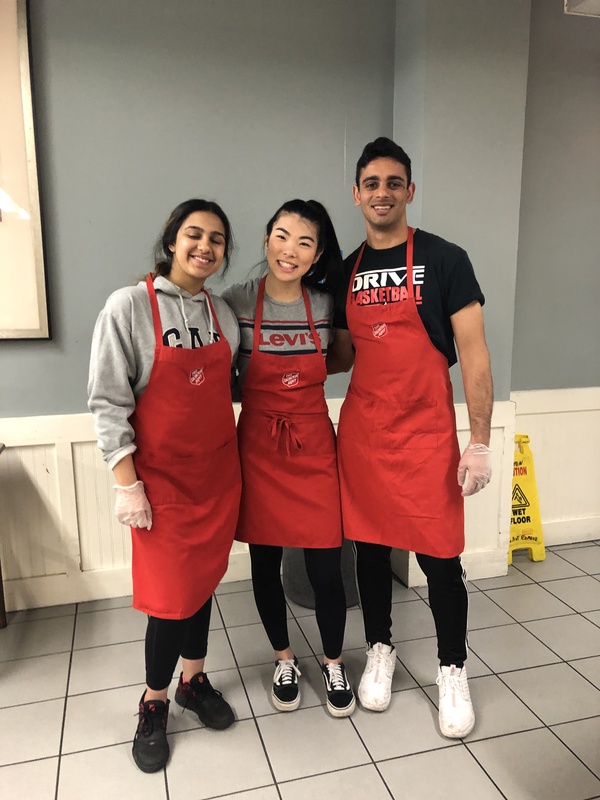 The soup kitchen was an extremely eye-opening experience for me, especially because it threw out all of my predisposed assumptions about the place. Firstly, I was surprised to find so many Asian seniors eating there; since Richmond is home to countless affluent Asians, I had built this innate stereotype that most immigrant Asians were middle class or higher. Outside this demographic, it was clear that the other diners also came from all different walks of life: there were men and women, old and young, and people in brushed trench coats or tattooed in tattered attire. This all-just goes to show that there isn’t a “typical image” of what a person struggling with homelessness or addiction and using the soup kitchen looks like. However, one thing they all have in common is that they are each actively trying to better themselves–there’s a certain stigma attached to using the soup kitchen, but I think the very fact that these people are seeking support rather than “wasting away on the streets” shows a certain resolve to improve their lives. Our guide that day, Patrick, said that everyday he’s there he’s “fighting for his life”, and I guess they all are, but even though it’s sad, it’s also terribly admirable. The most rewarding thing for me as I worked in the soup kitchen was seeing how the homeless found happiness in the small things. In today’s society, our generation complains about infinitesimal problems all the time and this showed me how small our problems really are. I have learned that if people with nothing to live for can smile and be content, then us as individuals in the modernized world should try and feel grateful rather than comparing ourselves to those above us. Comparing to others is what leads to confidence and self-esteem issues, and this would never occur if individuals just start to appreciate what they have. Overall, it was a fantastic experience and I can confidently say that this will not be the last time I volunteer at a soup kitchen. My trip to the soup kitchen was both eye opening and inspirational. I did not know what to expect when first walking into the kitchen; however, I was pleasantly surprised when we were greeted with such kind, caring individuals. When we started the process of handing out the food, I was a bit scared, but the process was very smooth and the people were ultimately just there to get food and leave. This experience definitely puts life into perspective and makes you realize how privileged we truly are, and how lucky we are to have everything that we do. Afterwards, I felt accomplished and very inspired to continue volunteering around the community. The Soup Kitchen trip was a very rewarding experience that gave me insight into the lives of the less fortunate. My task, along with another volunteer, was to hand out a piece of bread to each patron. Amongst our idle conversation they asked where I was going after high school and I replied, to SFU. To my surprise, they didn’t know where and what that was. It amazes me that something so big in my world and in the world of graduating grade twelve’s was nothing but three unknown letters to someone else. This trip has given me true perspective of the vast and varying lifestyles that different people live. The tension was building as the two lines faced each other. My heart was beating at an incredible pace as I held the blue water bombs. I felt the nervousness start to build up inside of me. The task at hand seemed nothing short of arduous but every team had the drive to win. With each launch of the fragile water balloons, the distance grew further, the intensity and difficulty had started to grow too. After the first several launches, the long awaited event had occurred. The first group’s water balloon had exploded. My nervousness had been allayed, my face cringed in resistance, my eyes tried to hold back the salty tears but I couldn’t hold it back. I let out the most evil, horrifying laugh. Little did I know it was the first raindrop before the massive storm! I looked straight ahead and there was the target. Balloons all around it and on the middle was the medal. It was pinned so that it shaped the center of the target. “If you hit the center, you’ll win a medal!” Ms. Watts said. Archery. A sport where you need great precision and patience. “No way am I gonna get that,” I thought to myself. I took a step and held the bow. My heart was pounding. I went and got an arrow. Eyes on the target, I slowly held my bow up. Closing one eye, I gradually stretched my arms. My hands were sweating and suspense filled the air. I quickly breathed a prayer and released. I fully opened my eyes and looked in front. I turned to Ms. Watts. “Did I get it?” We walked to the target to get a closer look. And there it was, the arrow right on the ribbon. “I got it!” I couldn’t believe it. It was like I was somewhere in a fantasy. I walked back filled with pride. I stood, alone, surrounded on all sides by prickly thorns. Below me rushed a tiny stream of water, and above me were layers of trees that created a slightly too cool shade for me to stand under. I could feel the thorns poking at my arms and legs with even the slightest movement. I couldn’t move without the little spikes digging into my skin. I knew, right then and there, that I had made a huge mistake. 200 eggs were cautiously hidden in this patch of forest. My team had found 12. Only one egg contained a precious point that could give us even the slightest edge in the hectic competition. In a desperate attempt to drag in more points, all the teams had ran back into the fray to try and find the remaining 23 eggs. So I thought to myself, “Hey, I’m wearing waterproof hiking boots. 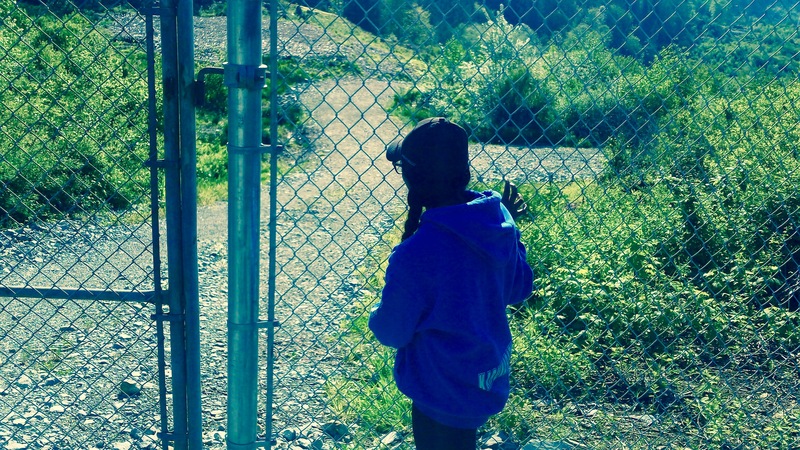 Maybe I can look around at the creek and see if I can find an egg?” But as I stood there, surrounded by nature’s barbed wire fences, hearing shouts of glee from the distance as people kept finding eggs, it came to my attention that no one would ever hide an egg here. No one would want to suffer my fate. To this day in my mind, I still stand there, in the creek, alone, hoping to spot an egg. But alas, my pointy prison never lets anyone escape. So beware, future egg hunters. Never look for Easter eggs in the creek. 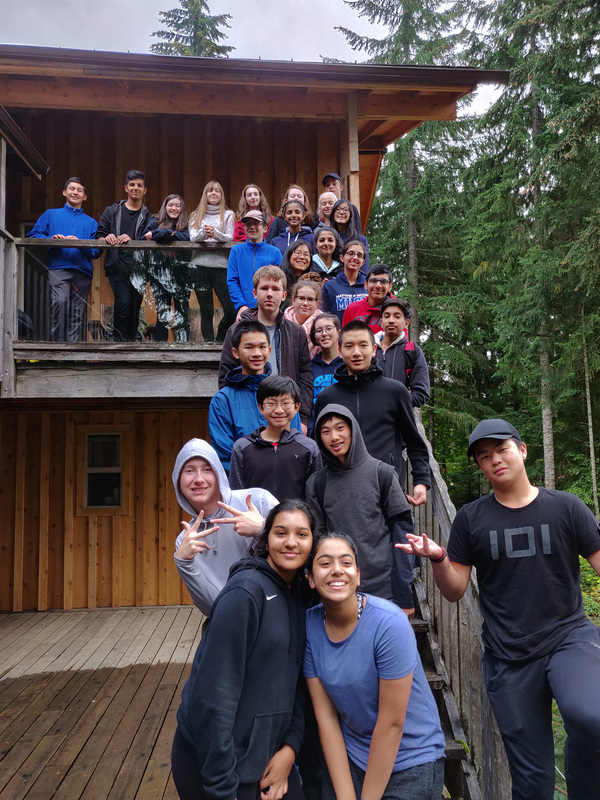 The grade 9 students just spent 3 days, April 25 – 27th at Timberline Ranch in Golden Ears Park with Mrs Watts, Mr Tuerlings and Mr. Young. 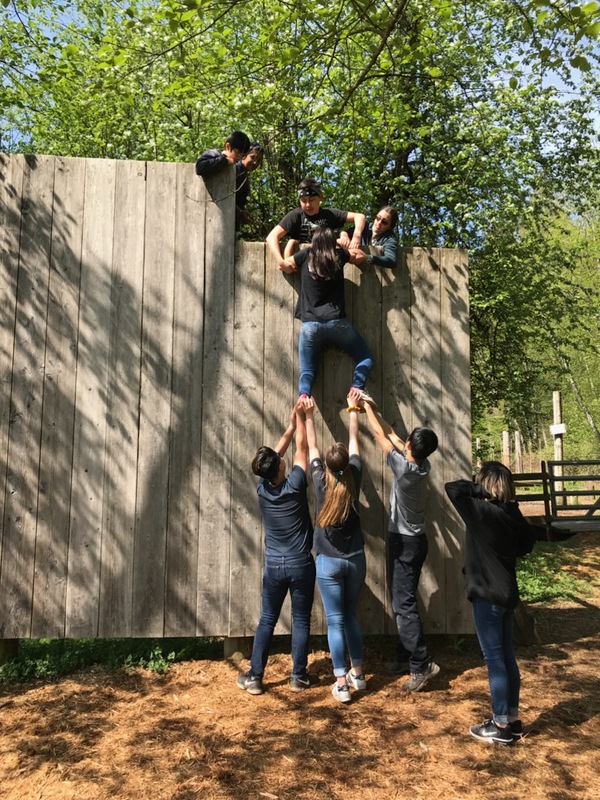 While at Timberline the students participated in many activities, including: Horseback riding, rock wall climbing, archery, team building, square dancing and of course our now famous Amazing Race. 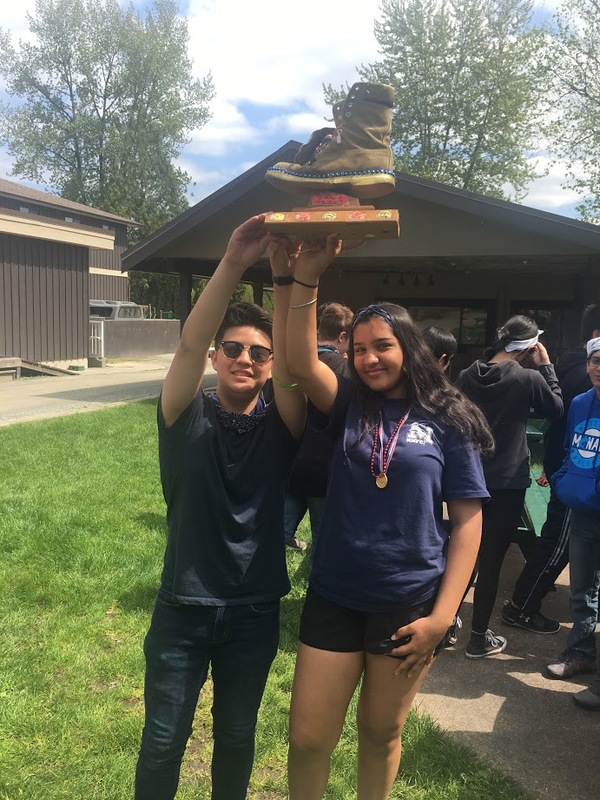 For the race students were placed in randomly selected teams and competed in a myriad of activities over the 3 days, all in the quest to have their name placed on the coveted Golden Boot! When we returned from the trip I gave the students the following questions to answer in reflection of what happened on the trip. Below are some of their comments. You participated in many organized events while at Timberline. Explain the connection to physical education to at least 3 of the events. Think about the 5 components of physical fitness and how those events tied into them. 2. Your partners for the amazing race were selected randomly from a box. Why do you think this was done? And what do you think it eventually taught you? 3. Being a part of Mini school means belonging to a community of like minded individuals. Explain what you feel you “get” out of these trips and why they are important to the success of a mini school class. Furious winds roared, carrying heaps of snow across our faces. We struggled through knee-deep snow. The time had finally arrived—the moment we all desired. “Cheese!” The photo was taken, or so we thought. “It’s not working!” our instructor cried through the blizzard. However as fellow Instagram users, we were destined for a photo with an inuksuk while facing an infuriating storm. If we weren’t cool in real life, at least we could fake being brave while standing in a blizzard. The picture didn’t show the building we raced into seeking warmth once our picture was captured after all. Hard work paid off; through struggle and determination, our blizzard picture was Instagram-worthy at last. Now the experience I’m about to share is sure to be taken lightly, although it shouldn’t be! I am here to tell you about my awful fight with the snow, wind, and rain, and it’s sad to say my greatest enemy was the atrocious weather. I was bundled up in the warmest clothes I owned, yet the cold couldn’t help but penetrate through, sending shivers down my spine and leaving my teeth chattering all thanks to the bitter cold. I still remember getting on the ski lift the second day. My feet left the ground and the ski lift went upwards. The soft, yet freezing cold snow, rain and wind began whipping at me, and in a matter of seconds, I was covered in snow and drenched with rain. If I think hard enough, I can still feel the coldness of each drop of rain seeping through my gloves and touching my already numbing hands. When the blissful moment to get off the ski lift arrived, I jumped off as fast as I could. I looked down at the medium-sized, glacial mountain apprehensively yet with a small spark of excitement. Uttering a silent prayer, I followed my ski instructor down the mountain. At that moment, all I could think about was my state of fear and my focus on making it to the bottom. While skiing down the mountain and dreading my existence because I was just so cold and tired, I felt the same sensation of the snow, rain, and wind against my face. Yet, somehow, it felt different. This time it felt incredible. This time it made me feel alive and gave me the inspirational push I needed. Today was my first time visiting Canuck Place and it was nothing short of a truly moving experience. I had always known that it was a place for terminally ill children to stay and be taken care of, but I now know that it is so much more than that. Canuck Place is a home away from home for sick kids and their families to stay for free, let go of their worries for the future, and focus solely on being together. It astonishes me how of the 11 million dollars it takes to annually finance the hospice, 80% of the funds come from community donations. This goes to show the kindness of people who give their money to provide the meals, medical care, and happiness to others, and also punctuates the significance of the cheque we presented. It is true that there is no donation too small because just before us, an eight year old boy had donated all thirty dollars of his birthday money and like his, every last bit of the thousand dollars we gave could mean the world to a person in need. I left Canuck Place with my heart warmed and a sense of pride—for myself and all of the Mini School—because nothing compares to the feeling of fulfillment from helping light the lives of families whose struggles are unimaginable to us. The compassion and generosity of humanity had never been more evident and the inspiration to be part of a community working towards making a difference will forever stay with me. 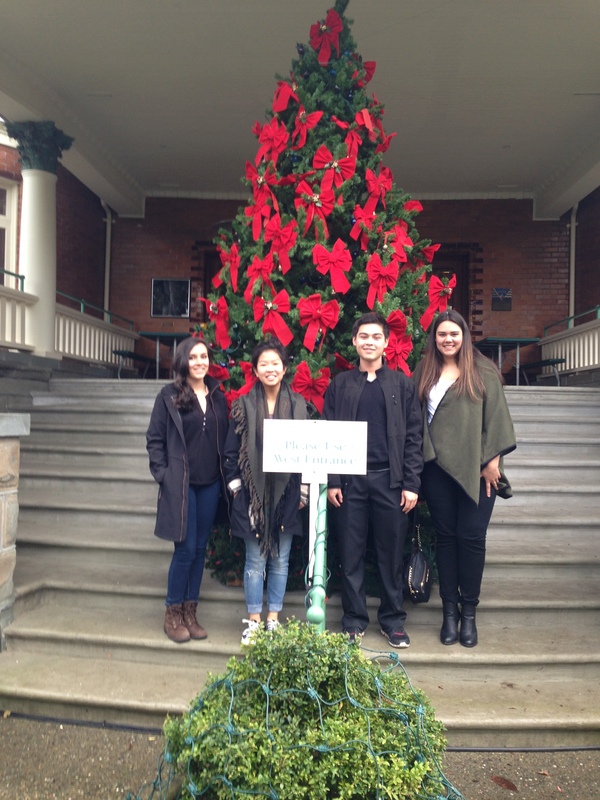 Visiting Canuck place was a very humbling experience. I was a little bit nervous before going inside because I had no idea what to expect. But, immediately as we stepped through the doors we received such a warm and friendly welcome that all my apprehension disappeared. Not once did I see a anyone who looked unhappy despite the circumstances they might have been in. This was because of the love and compassion that filled the air. The sense of community and belonging truly made me believe that Canuck Place is the perfect place for children to forget about their illness or spend their final days. It warms my heart that mini school supports such a well deserving foundation. 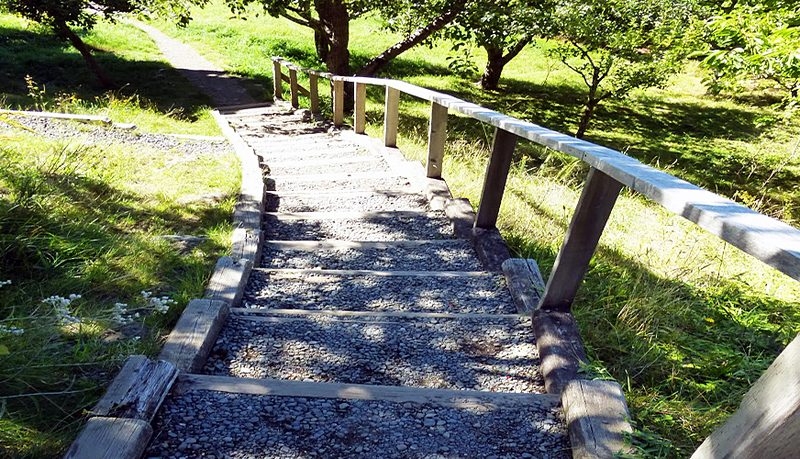 The trip to Canuck Place was not only an eye-opening experience, but also a reminder of what being a part of mini school is. Being so familiarized with what we–as mini school students–do, it can be easily forgotten how beneficial our role in the community is. Though it may not seem particularly notable to us, our active participation in and fundraising for various charities and organizations does make a difference. 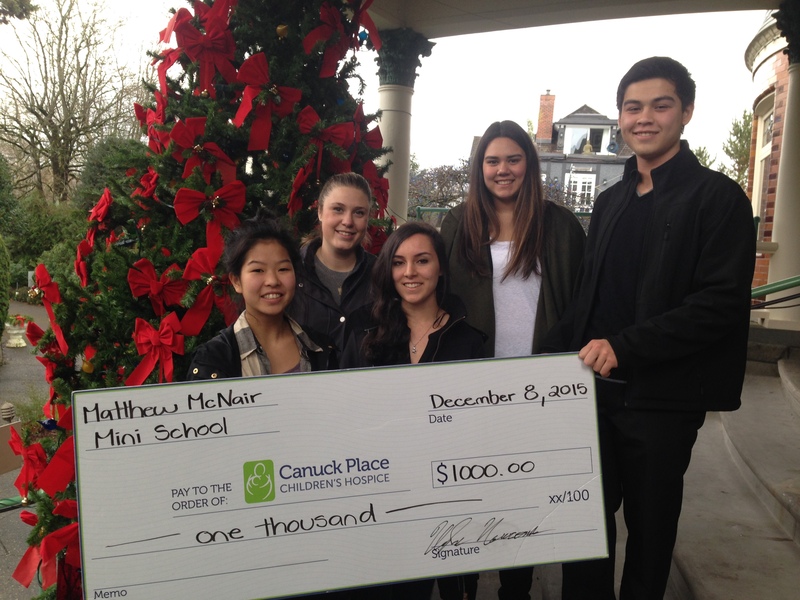 This year, the mini school donated $1000 to Canuck Place. Despite how little it seemed compared to their yearly expenses, the staff there was extremely grateful nonetheless. When the representative told us that 80% of the 11 million dollars Canuck Place needs annually comes from donations, a new vista on the Lower Mainland was opened for me. I was amazed at how selfless our community could be and it was gratifying to know that the mini school could contribute to such a benevolent cause. Today, four mini school students, me included, were allowed to observe the effect that our arduous efforts do to assist our community. The thankfulness of the volunteers at Canuck’s Place was palatable as we gave them the cheque, earned through the proceeds of our friends and family as they watched our Oscar winning performances during Arts Night. To be given the opportunity to be surrounded by the people and the place that is the beneficiary of our efforts, is truly a mesmerizing experience, and it is one that has redefined the meaning of gratitude for me. I remember indulging in the act of stargazing countless times in the past—all being wondrous spectacles—but this experience, here on the top of Mt. Myra, is incomparable. I lie beneath the myths of indomitable gods and heroic feats depicted in the same constellations seen by the very people who conjured the stories. Two thousand meters above ground, the ancient legends livened in the night sky for once do not humble me, but rather feel personal, as if they are tales of close friends. Far above the plasticity of humanity, I feel as if I can jump into the stars and become part of the immortalized legends because greatness is much easier to see with a change of perspective. Lying on the weather-beaten wood, waves lapping gently against the old, battered dock, we stare up at the infinities of the universe in the dark of the starlight. How our lives have intertwined to this very moment, I wonder. To be among a group of individuals with unparalleled journeys, yet our crossing point lies here. From what we have been, to what we have become, to what we will be, we reside here: under the cosmos, under the night sky, under the comfort of each other’s presence. I observe the constellations, spying the big dipper, the North Star, and Saturn (a blinking orange star). However, to my delusional frustration, I fail to see the elusive shooting star. “They’re everywhere,” they say. “If they were everywhere, I could probably see them,” I retaliate. I am being explained of the properties these seemingly invisible shooting stars possess: they leave a trail of light, they do not last long and I will know when I see one. Hence, I lie, hopelessly searching for the streaking star I do not find. Shooting stars are metaphors of us; our lives are infinitesimal relative to the lifespan of the universe. Shooting stars leave a gleaming trail of light, similar to how our past is a shimmering reflection of us. We continue, forging our realities until we succumb to our inevitable human demise. Like the star dissipating into oblivion, we, too, disappear into the abyss. I was standing in the midst of a rapidly streaming river as I felt my legs go numb, my arms tremble, and the feeling of warmth slowly escape from every inch of my body. In that moment, I realized what I thought would be a shallow river had covertly swallowed my 5.2-inch figure, with only my head left to hover above the surface. The trepidation quivering through my veins while being among my fellow friends—just seconds before leaping into the river—was immense. It was three of us who decided to take on the challenge of indulging in ice cold water that bright afternoon, though only I amongst all of us had a fear of deep water. On the count of three, we submerged into the river with an enormous splash, and despite almost freezing to death, the fear had unknowingly slipped out of my mind, and we were filled with yet another unforgettable experience. The epiphany was then clear—that you will only get over your fears by pursuing them and conquering them. The act of traveling through an unfamiliar area comes with its challenges and glories. The natural reaction in a cave is the feeling of being trapped, though in total darkness the overwhelming feeling of complete freedom conquers all others. Inside the cave, the air smells fresher, the oxygen feels cleaner, and the world seems greater. Even seventeen meters down in the earth, you feel as though you are on top of the world. The experience of complete darkness is one I will never forget. In the absence of light, you cannot see your own hand waving in front of your face, yet you are able to see the true beauty of the circumambient nature. Man has become corrupt by the concept of time; the inevitable future as well as the contrite past has made humanity lackadaisical about what is truly important: the present moment. 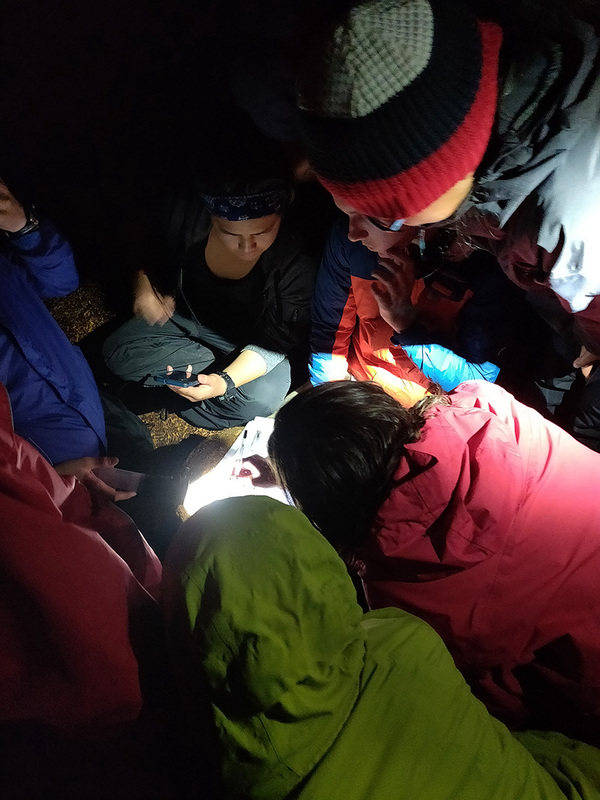 This past week, I had the fortune of grasping bits of the “present”, wherein I ventured into the macrocosm of nature with my peers on a caving trip at Strathcona. The experience of living as one with nature, devoid of physical time management, is truly ineffable. I awoke from my slumber in the mornings with the sunrise. I sang with my friends late into the night with nothing but the campfire illuminating our faces. I slept when the darkness crept up on our group, setting lethargy into our bodies. It is, suffice to say, that I truly envy nature and its feral animals that live free from the chains of time. The majestic deer has no worry of its future, no worry of paying “silly taxes”, no worry of going to school and completing mundane tasks. I wish to embody nature. I wish to feel the sense of freedom that comes with escaping the binds of time. Nothing in the world compares to the feeling of watching the sunset across a beautiful lake, the view of the luminous stars in the nocturnal night, and the fact that the concept of time never once crossed my mind while appreciating those moments. On this Strathcona trip, I became pregnant with new experiences, and it is these experiences I have with my classmates on these trips that I will reminisce about in the future. It is these amazing experiences that will help remedy my future pains and my past struggles. And it is these labyrinthine experiences that makes McNair Mini school, in retrospect, the best thing that has happened to me thus far in my life.